El Dorado!! For centuries adventurers have been searching for this mythical city of gold. And now the nearest thing to El Dorado is Shri Padmanabhaswamy Temple in Kerala. First, huge amount of cash and gold in Sai Baba’s bedroom and then astonishing amount of treasures hidden in this so far not-so-famous temple of South India – but why are we so surprised? God in Indian conception is always a dazzling, bejeweled presence!! And not only in India, in every civilization God and wealth have a very close connection. One possible explanation could be that a place of worship perhaps provides the best protection for extraordinary wealth. People are still searching for the treasures of the temple at Jerusalem nearly 2000 years after its destruction – recently a scholar claimed that it may be hidden in present day Palestine though most people believe that it was taken to Rome. From ancient Egyptians to Incas of South America, there is no death of stories about fabulously rich places of worship. Vanijye Vasati Lakshmi: India’s richest people are regular visitors and major donors at some of the country’s wealthiest temples like Tirupati, Sirdi or Siddhivinayak. At times they patronize or contribute lavishly for some particular religious sect or mandir – one of India’s most prominent business families has in recent years contributed significantly in complete up gradation of Srinathji temple and surrounding areas in Nathdwara, Rajasthan. Between 725 AD and 1701 AD Somnath temple in Gujarat was raided and destroyed 6 times even though the most infamous raid was that of Mahmud Ghazni in 1024 AD. There is a contemporary account, which says that Mahmud took away from the temple a number of gold and silver statues and other precious items – the total loot were estimated to be worth twenty thousand gold dinars and was used in rebuilding his capital Ghazni. Equally important to note that from the Sind Governor, who destroyed the temple in 725 AD to Alauddin Khilzi and Aurangzeb - every conqueror found enormous wealth in this temple. Major contribution for any temple comes from the trading and business community – perhaps because they need God on their side more often than ordinary mortals do. Since Somnath is situated along the most important trading route of India, it is but natural that the temple would be endowed with riches. And it is not only this particular temple – we have enough evidence to suggest that Hindu and Jain temples of Gujarat were repositories of incredible amount of wealth, which were repeatedly looted by various attackers. Again, this has been the trend world over. Buddhist monasteries along the famous Silk Route were famed for their astonishing wealth – both spiritual as well as material. Some of the richest hauls of ancient treasures in Asia have been found from Buddhist monasteries and other buildings in India, Afghanistan and Central Asia – all spread along major trade routes. There are many legends about the hidden wealth of the Templars in Europe – one of the themes in Dan Brown’s famous Da Vinci Code – though monks and Christian soldiers in theory, Templars amassed their massive wealth by controlling and participating in trade and by lending to Kings. 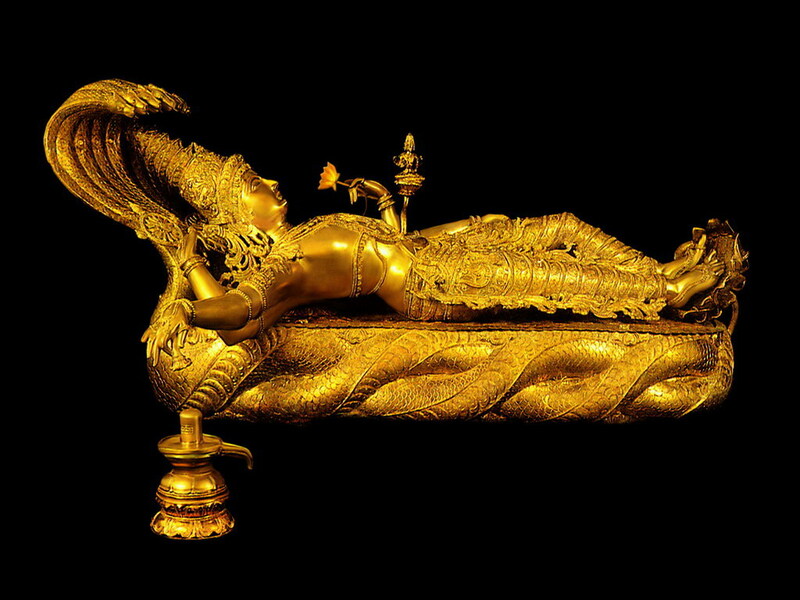 Southern Splendour: But on both counts – close links between God and wealth and link between temple and trade - it is difficult to beat South India. We have evidence at least from the Chola dynasty (9th century onwards) to suggest that a significant part of the economy was used to be driven by temples. A temple generally provided the focal point of urbanization in a particular area and used to drive the economic, social and at times political life of that region. We have epigraphic evidence to suggest that these temples – or at least the bigger ones – used to actively invest money and participate in domestic and international trade through trading guilds like Manigramam or Nanadesi guilds. These temples were so rich that at times they even lent money to the King! Among the major temples were the great Shiva temple at Chidambaram and the Srirangaswamy temple; later the temples of Tanjore and Gangaikonda Cholapuram were added to this list. Between 1309 and 1311, Malik Kafur, Alauddin Khilji’s celebrated General led two military expeditions to South India. At the outset, it was pointed out that the entire region was dotted with rich temples, which owned huge landed property and were involved in trade and money lending in a major way. Kafur defeated the rulers of present day Maharastra, Telangana, Hoyasalas of Karnatakas and looted - though could not completely defeat - the Pandyas of Tamil Nadu during the course of his two expeditions. When he came back from the Deccan after subjugating the rulers of Maharastra and Telangana, two hundred camels carried the booty and a dazzling exhibition in the capital showcased the riches Kafur brought from the South. Much of this priceless booty was looted from the temples. During his second expedition, Kafur came back with more gold and jewels plundering cities and temples up to Rameswaram – among the temples he looted was the great Chola temple at Chidambaram. From the 14th to 16th century, under the great rulers of Vijayanagar, temples regained their prominent place in South Indian economy and society. A number of travelers have written about great temples prospering on the basis of extensive land grants and then investing their surplus in trade and money lending. Interestingly, one of the travelers – Persian Abdur Razzaq described cells similar to those being opened at Padmanabhaswamy temple today in a royal palace of Vijayanagar – basins filled with gold and different jewels! Divine Masala: In 1498, Portuguese adventurer Vasco da Gama reached Calicut – it was an epoch-making journey in World History, comparable to the discovery of America by Columbus. It has been a matter of debate for a very long time that what motivated da Gama in his quest for India – there is strong evidence to suggest that the immediate motivation was the desire of the Portuguese King Manuel to become a King of Jerusalem, birth place of Christianity and the zeal to discover the legendary Eastern Christian Kingdom of Prester John. But as da Gama reached Calicut what came to dominate European imagination was spice trade, or more specifically trade in black pepper instead of religion. Pepper was worth in gold in medieval Europe. Pepper and other spices used to travel from South East Asia and various Western Indian ports from Calicut to Cambay to Red Sea ports and from there through overland routes to Egypt and then to Europe. Egyptians and Italian merchants used to control this lucrative trade. da Gama’s voyage brought Portuguese in this equation and the most important contribution of the Portuguese in this trade (or Indian Ocean trade in general) was to introduce a system of monopoly, which they enforced ruthlessly. Fast forward to 1730, in Southern Kerala a new empire under King Martanda Varma was fast taking shape – he forced smaller zamindars into submission, established a standing army and bureaucracy and managed to defeat the Dutch forces with the help of the English. And to fund his empire-building, he took a cue from the Portuguese and monopolized the trade in spices. Taking advantage of disturbances and decline in other ports in Western India, Travancore and its new port of Alleppey (Alapuzha) became the main centre for spices trade. Merchants were turned into government servants, a new department of commerce was opened and royal monopoly resulted in doubling of prices of pepper – an efficient management of this trade under Martanda Varma (1729-58) and then Rama Varma (1758-98) turned Travancore into a golden state. It was mainly the proceeds of this spice trade, which went into royal treasury and as it seems now, increasingly into the underground vaults of Padmanabhaswamy Temple since January 3, 1750 – the date on which Martanda Varma dedicated the Kingdom of Travancore to God Padmanabha and since that day all Travancore Kings ruled as “Padmanabha-dasan” or servants of Padmanabha.